Since tomorrow is Mother's Day, I thought now would be a good time to finally write my birth story. It's been replaying in my head since the day she was born, but finally putting it into words has been so difficult. I am no writer, but here is my best attempt. I had my first contraction on the afternoon of January 8th. Bennett was at the grocery store and I called him to let him know. He checked out quickly and came home. I knew better than to get excited because labor could still be days, even weeks away. I had a couple more before bed and then woke up disappointed the morning of the 9th when nothing had happened all night. Around 9am I called my mom to let her know that I only had a couple contractions, but nothing that morning. I'm fairly certain that I told her I thought I'd be pregnant forever. After I got off the phone I went to the bathroom and screamed for Bennett. I had my bloody show, and this meant progress. Labor was near and I was so ready. I called the birthing center and they recommended that I sleep and eat since it was only a matter of time and I'd need as much energy as I could muster. Of course I didn't listen and attempted to go on a walk. I wanted this baby OUT. We only made it a couple blocks before I thought I was going to puke and we had to turn around. I came home, put a pot roast in the crock-pot, and took a nap. Around 6 pm contractions started. We were eating dinner, the last meal I'd eat for almost 24 hours. It wasn't anything too painful, just strong menstrual-like cramps. Bennett put Cheers on to get my mind off of them which helped at first. After 3 episodes though, I was on the birthing ball breathing through each contraction. I called my mom to let her know I was having contractions 20-30 minutes apart. She decided to go ahead and buy a plane ticket for the next morning even though I was convinced it would still be a few days before anything happened. I told her I'd call her in the morning if nothing progressed so she could cancel her flight. We went to bed around 10:30 pm. I remember thinking "If this is what contractions are, I've got this. Piece of cake." I was so wrong. I woke up at 1 am with contractions so strong I could barely move. It was back labor. I could no longer feel anything happening in my belly, it was now all in my back. I moved off the bed to the birthing ball and had Bennett press on my back as hard as he could during each contraction. They were 10-15 minutes apart, and I tried to sleep in between them (that never happened). Around 7:00 my mom called. I had a contraction as soon as Bennett answered the phone and told my mom he'd call her right back. My mom later told me that she heard me in the background and as soon as Bennett hung up she grabbed her suitcase and told my dad to take her to the airport. At 8:00, contractions were still about seven minutes apart, and we were supposed to wait until they were 4 minutes apart to go to the birthing center. I told Bennett I couldn't wait and we needed to go now. As he called the number to see which midwife was on call, I watched his face nervously. When he smiled I knew our favorite midwife was on call and I felt a huge sense of relief. He called her and she said to come in an hour and she'd check me. In between contractions Bennett packed the car up with our bags and coolers of food. After he'd take something to the car, he'd come running back in to rub my back through a contraction before taking out another load. I always imagined the car ride to the center. I imagined it would be dark outside and I'd be nervous at every red light that someone would see my very pregnant self breathing through contractions in the front seat. Bennett would be running red lights and I'd be screaming. It was nothing like that. The sun was bright and I couldn't have cared less who was watching me through the window. When we arrived Bennett ran on in to get Andrea, our midwife, and I made it to a bench before having another contraction. She came out to get me and helped me through the contraction before getting me inside. She helped me into my birthing suite and onto the bed. I was so afraid she'd check me and I'd only be one centimeter. Bennett held my hand and we waited for the verdict. Andrea smiled and happily announced that I was five centimeters and 95% effaced and said, "You're going to have your baby today!" I burst into tears. Those were the most wonderful words I had ever heard. Up until that point I was in denial about actually being in labor. Everyone told me since it was my first baby I'd go past my due date, and my due date was still a few days away. This is really where things become blurry. Andrea recommended I take a hot shower to help with the back labor, which felt amazing until I thought I was going to puke. I got out and moved to the birthing ball while Bennett unloaded the car. Andrea massaged my back and I kept apologizing for making her sit there. She would just smile and say it was her job to help me. After an hour the contractions (back labor) got worse and I moved back to the bed to lay on my side. Andrea heated up a tube sock filled with rice to press against my back. This was my only form of pain relief during all of labor. A tube sock. My mom arrived and popped in to give me a kiss. I was so happy to see her. I can't imagine what it was like for her, to see her baby in so much pain and there was no way for her to help. She left and went to a different room to sit with Bennett's mom. Shortly after, Karlie arrived. I've known Karlie since the second grade, and we've been best friends since the seventh grade. She wants to be a midwife, so we've always joked that she'd deliver my babies. When I found out I was pregnant I knew I wanted her to be my doula, even though she lives in Tennessee. Several weeks before my due date we decided that January 10th would be a good day for her to come. She booked her flight and we crossed our fingers that the baby wouldn't come early. As fate would have it, she made it just in time. Karlie came in and went straight to work rubbing my back, getting me water, and taking all of these amazing photos you see here. She will never know how much these photos, and her being by my side, meant to me. All of a sudden, I had the urge to push. This scared me, and I told Bennett to go find Andrea. She came in and calmly asked me what I was feeling, and when I told her I felt like pushing she told me to let my body do what it needed to do. During the next contraction two things happened. First, I threw up, which made me SO happy since I knew that meant I was in transition. I knew I was so close to meeting my baby. Also, I felt a trickle while I was throwing up. Andrea said my water might have broken. A few minutes later, we found out that the trickle I had felt was not my water breaking. Andrea had left the room and I was bearing down during a contraction and out of nowhere my water broke. Scratch that. My water BURST. I looked at Bennett and Karlie and their eyes were so big. I yelled for Bennett to go get Andrea. This was by far the most terrifying part of my labor. My water broke with such force it absolutely scared me to death. And it hurt. Oh it hurt. Andrea came in and I was relieved to hear that there wasn't any meconium in the fluid. She warned me that my contractions would get really intense from here on out and I'd feel a lot more pressure. And she was right. Without even trying, I began to make low, animal-like noises with each push. I remember everyone smiling and encouraging me to keep making the noises as I would bear down. The birthing tub was filled up and ready at this point. Andrea and her assistant started to help me off the bed but I had the biggest, most painful contraction and I freaked out. I told them I couldn't get off the bed and I wasn't going to move. Looking back, I know the birthing tub would have really helped my back labor but I was so afraid. I had never felt pain like that and I was afraid that if I moved, my body would somehow break. So on that bed I stayed. For an hour and forty minutes I laid there and pushed. After every contraction Angie, the assistant, would check the baby's heart rate and I would be reassured that everything was ok. Baby girl was such a champ. Her heart rate only dropped once, for a brief second, when I was holding my breath. Andrea asked me to take a deep breath, and when I did, her heart rate jumped right back up. Bennett held my leg while Karlie put cold rags on my face and took photos. After about forty minutes of pushing, Andrea told me to reach down and feel. I could feel a tiny spot of my baby's head. It was so soft and warm, I'll never forget it. This was all the motivation I needed to keep going. By this point I was completely in my own world. I never spoke unless Andrea asked me a question, and I hardly opened my eyes. With every push, animal sounds would escape from deep inside of me. I kept pushing, and after a while I opened my eyes to see the biggest smile across Bennett's face as he told me that she had my hair. Her head was visible. Every push made it emerge more and more. Andrea got a mirror so I could see and sure enough, there was the top of her head covered in dark hair. I smiled and I knew I could do it. I was SO close. I was starting to lose energy so Angie gave me a straw filled with honey for an energy boost. I don't even like honey, but I swear I've never tasted anything so delicious. I practically inhaled the straw while Karlie and Bennett chuckled at the slurping sounds I was making. I could literally feel her moving through my body. It was the most spectacular feeling. I could feel her move and twist and before I knew it, there was the ring of fire. I looked down and saw her head and even though I was supposed to wait, I pushed with everything I had and let out a yell so loud and felt the sweet relief of her warm body slip out. It was 3:53 in the afternoon. Her cord was around her neck, but Andrea was able to hook the cord and she slid right through it. Andrea helped Bennett catch her and he lifted her up and on to my chest, just as she was pooping all over me. The pain was gone. 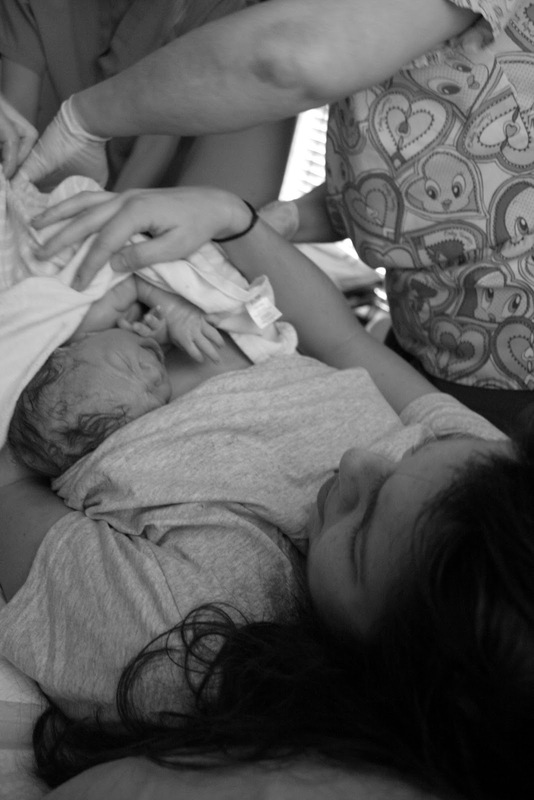 I felt nothing but relief and overwhelming love for the tiny, warm, screaming baby on my chest. My first thought was how much she looked like Bennett. She was so alert with her eyes wide open and I kept saying "Hi my baby! I'm your mama!" Bennett was crying and laughing and I just couldn't believe that she was here. This baby that was growing inside of me for 9 months was now here! In my arms! And she was perfectly healthy and beautiful! My mom and mother-in-law were two rooms away waiting. Towards the end they could hear me getting louder and louder so they stood in their doorway and listened. My mom said as they were standing there, they heard me cry out and then all of a sudden they heard tiny crying. She said they started hugging and jumping up and down. After ten minutes or so, Andrea asked me if I wanted to see my mom and let them back to the birthing suite. My mom came in and burst into tears. I'll never forget how she looked at me. She ran to my side and asked me if I was okay. She didn't even look at the baby on my chest because I was her baby. She had to make sure that I was alright before anything else. I just kept saying "I did it! I cant believe I did it! This is Marlowe! Marlowe Dean!" The only time Marlowe left my chest for the first couple of hours was about thirty minutes after she was born. My placenta was slow coming out and Andrea thought I might need a shot of pitocin to get it moving. Luckily a couple rounds of homeopathics and getting me in a squatting position did the trick, and then she was right back in my arms. After a couple of hours, Bennett took her out into another room to show her off to our families while Andrea stitched me up. Because I just couldn't wait to push her body out after her head was born I gave myself a nice second degree tear. I was more nervous about the stitches than I was at any time during my labor. Karlie sat with me and held my hand while she talked to me about anything and everything to keep my mind off of it. The woman we hired for placenta encapsulation came and made me a smoothie with a small part of the placenta to help stop my bleeding. She took the rest with her and stopped by our house 2 days later with a jar of placenta capsules. I never had the slightest bit of postpartum depression, and I honestly believe that it was because of these capsules. Read more about the process here. After the stitches, Karlie helped me shower and into a robe. Marlowe had her newborn exam while we all sat around and watched. 7 lbs, 6 oz and 21 inches long. By 10:00 that night, we were on our way home and spent our first night together as a family in our very own bed. Never once did I tell Bennett I needed to go to the hospital. There was maybe one time where I told him I couldn't do it and he said "But you are doing it!" No one ever looked worried or raised their voice. They constantly encouraged me and told me what a wonderful job I was doing. Every time I looked at Bennett he looked at me like a child on Christmas morning. He was so supportive and I could not have asked for a better partner to embark on this journey. The birth of Marlowe Dean was the most incredible and rewarding experience of my life. I see everything differently now. Growing and birthing a child is truly a miracle. This sweet girl made me a mother, and I will always love her to the moon and back. Oh so beautiful. This takes me right back to the birth of my son and makes me so excited for another. 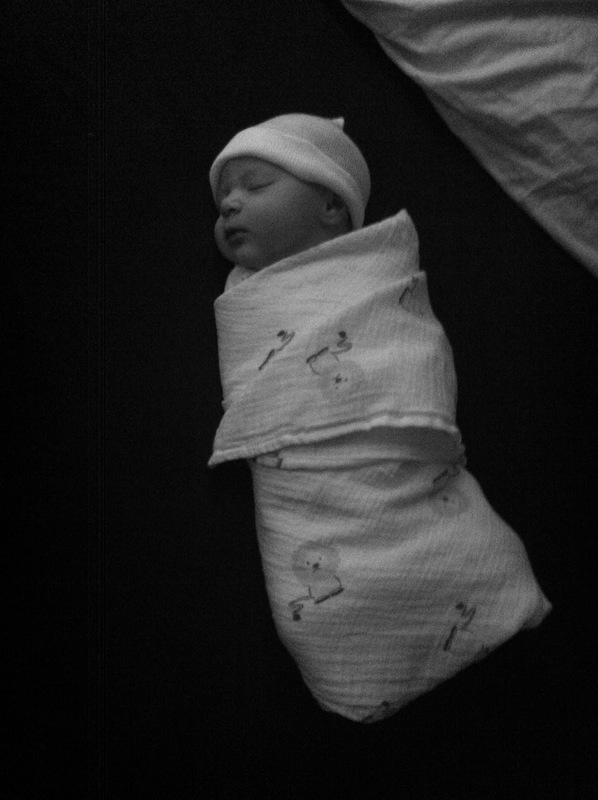 Those pictures from when Marlowe was first born - wow. So emotional and beautiful, they are making me weepy. Happ first Mother's Day to you. Such a beautiful story. Thank you for sharing... You're making me teary! This is so beautiful, I have tears on my cheeks! Well done and hope you had a lovely mothers day with your family and little lady! Wow this is incredible!! What an amazing experience, Jenny..thank you so much for sharing. such a moving story. i cried through the end of it. thanks so much for writing it here. Hi Diane! I did not have any drugs during labor or delivery. I delivered at a birthing center and they do not administer any sort of pain medication. They did (thankfully!) numb me up when they did the stitches, though. I'm based in Tampa, Florida : ) Good luck on your labor and delivery! You can do it! I just re-read this -- so moving, Jenny! And lastly- Jenny, you are a serious badass.